Why is it that we now go to a supermarket not to buy eggs, but to buy eggs that have come from chickens free to eat where they like? What is this if it is not the start of a journey towards meaning, towards reconnection with nature? I am extremely proud of the Eden Project’s association with Mark Edwards. When he first suggested the idea for Hard Rain as a photographic essay resetting the Cold War anti-nuclear lyric of Bob Dylan’s song to fit our changing times, we were immediately excited by it. The lyric would tell a different story, one no less terrifying in anticipation, but here hardened with a wider narrative that shames our claim to the title Homo sapiens. The first exhibition was launched at Eden in May 2006 and it stayed up for nine months. Nearly a million people saw it and were moved. We have never had such a postbag for an exhibition, nor such expressions of outrage and admiration. Why? People must surely watch the TV news, or read newspapers? They couldn’t be shocked or surprised, could they? Well, many agreed that they were aware of the individual tragedies or situations illustrated in the photographs, but what got to them emotionally was the combination of poetry (as opposed to commentary) and the harsh beauty of the imagery, which in turn made them complicit. Each person reacts differently to being confronted by images as compelling as those of Hard Rain. Some can view them with near-detachment, reading them as an allegory, a cautionary tale. Moving, as a great work of art is moving, but not experienced. Others see them as a call to action, an incitement to impotent rage, or as evidence for the eternal failings of mankind and a reason for depression or cynical despair. However, a connection was made and connection is the most important thing. We live in a communication age, yet the distinction between transmission and reception is lost on most communicators, who seem content to address each other. As any fascist will tell you, uplifting exhortations and the big picture can stir the heart to action and create a momentum behind an agenda that is played as serving those ends, but if you don’t have a vision of the future, a narrative that leads you to the sunlit uplands of the imagination, that hints at a future possible with you, yes you, as a player in the story, it will perish on the vine. As the great anthropologist and myth collector Joseph Turnbull has said, the purpose of myth is to create meaning, not describe fact. Those who believe that societies with a rich mythology are “primitive” are blind to their own. Why is it that we now go to a supermarket not to buy eggs, but to buy eggs that have come from chickens free to eat where they like? Some of them are organic and the boxes in which the eggs are contained are biodegradable. What is this if it is not the start of a journey towards meaning, towards reconnection with nature? This and the myriad other stories growing up around the way we live and consume are the first stirrings of a society rediscovering its need to belong to and be a part of nature, not apart from it. C.S. Lewis once said, “While science may lead you to truth, only the imagination can lead you to meaning.” It is arguable that the near-messianic way we have begun to embrace climate change, and the need to address our behaviour by bringing it more in tune with “natural” ways of living, are part of a fundamental shift in a global culture instinctively ill at ease with its direction. Climate change is both a real threat and a symbol of “the Fall”, reigniting a secular thirst for spiritual transformation and belonging which will see our national narratives embrace concepts of community and responsibility with a fervour previously reserved for the cult of the individual. All across Europe and in the United States fertile ground is being prepared for this. Charles Darwin’s world-changing and culture-shaping concept of natural selection, the idea of the survival of the fittest (meant by Darwin to reflect “fit for purpose”, as in having adaptations to an environment giving the best chance of survival), has strangely been understood by many to see evolution as a form of design development that will relentlessly lead to “perfection” – a super-adapted life form. The present is never a good place to imagine the future. We know two things for certain about it: first, that the background noise of our personal lives and the needs of the now will distract us; second, the future as imagined will always be wrong. While the science-fiction writers of the 1950s imagined almost every technical invention that we now take for granted, hardly anyone, with the possible exception of Aldous Huxley, imagined the massive social change that would transform society over the next fifty years. Emerging gender equality, ethnic diversity, human rights, gay rights, single families, the ageing population and the transformation of ideas about what constitutes a nuclear family were almost entirely missed. It is important to acknowledge that over the last twenty or so years there has been a huge improvement in living conditions all over the world. The fact that there remains such an unimaginable number of people in poverty, without access to basic needs, or to the minimum of human rights, is a disgrace when measured against our publicly stated aspirations for the improvement of the human condition. But as an absolute things have got better and continue to do so (according to some criteria). What is extraordinary is that the number of people moving out of poverty is huge, but in percentage terms it remains virtually the same as it was in 1909 and 1959. Is there a mechanism missing to unlock the development agenda further still? The success of new business models such as the micro-credit revolution inspired by Muhammad Yunus’s Grameen Bank, first in Bangladesh, but now extending into many other countries, appears to point a way towards liberation from poverty and hence returning control of people’s destinies to themselves and their communities. There is much evidence that wealth generation and education lead to a decline in birth rates; poverty alleviation lies at the heart of any solution to population control. The fact that with increasing wealth come other demands, including dietary change, which in turn has implications for land use and food security, is a distinct issue needing different approaches. An example would be organizations such as Slum Dwellers International (SDI), whose philosophy and operating strategy encourage the creation of groups or associations of the poor which make themselves “visible” both to themselves and to government institutions. While undoubtedly many of the participants have found it difficult coming to terms with being a member of such a new construct, the impact on their wellbeing and ability to influence political and economic systems to their advantage is reshaping the landscape for the poor. The environmentalist Paul Hawken in his recent book Blessed Unrest describes the new emerging politics of NGOs and pressure groups, estimating that globally there exist nearly a million such organizations. Hawken takes a very optimistic slant on this vast yet leaderless group of interests and likens them to the antibodies in the human immune system, getting together to fight an infection and then moving on. He sees this as the emergence of a movement that is totally new and moreover one that has a tool at its disposal that was previously unavailable: the internet. The speed of communication and the availability of open-source knowledge is an exhilarating development and one that redefines many things, including our ideas about what constitutes a culture. I would date the roots of this new generation to the Horn of Africa famine of 1984–5 where millions were displaced and over a million died. The pictures made harrowing watching, and although compassion fatigue inevitably set in, every time an individual story was highlighted the strong reactions returned. When someone is there in front of us with a name and a story to tell – we respond. Despite the cynicism that often sets in post-event, Live Aid was a seminal moment in making a huge number of people realize the enormous power that connectivity could unleash. It painted a prospect of a better world where a light shone into the dark corners. Nearly thirty years later this vision is coming to pass. When you see a child in flames, a husband cradling his poisoned wife, dogs eating a corpse or a man in a wasteland cutting the last remaining tree, is there anyone with humanity that would not have wished it otherwise? A palette of pain and suffering is relatively easy to marshal, and to add to the woes with a further litany is overkill. Edward Said, who first described the need to create “otherness” to help the self-definition of those who were doing the describing and hence feeding the demonization or victimization of others, would enjoy seeing the weaponry turned to advantage by the dispossessed. Who would have thought that a quiet man with a great vision, Muhammad Yunus, could have reinvented corporate action in a highly successful business venture that has the poor as the main stakeholders? Who would have believed that young people pouring out of our universities could have turned the concept of “knowledge is power” on its head and sought to make knowledge freely available to all? Who would have believed that the excesses of Wall Street would have been condemned as selfish, greedy and ultimately damaging to everything most of us believe in, by none other than the President of the United States? And what of those old gurus Milton Friedman, Hayek et al., with their vision of a dog-eat-dog world where wealth would trickle down like crumbs from the rich man’s table? They would have us believe that we are better off because of their work and their belief in the free market rampant and the myth they peddled of a world where growth could continue into the infinite future. We are brighter than that, we are Hom. sap… how could we believe it? Dan Quinn’s gorilla could just as easily have had this as the myth that all men live by. Jared Diamond in his book Collapse writes about the rise and fall of civilizations from the beginning of recorded time. The inevitability of collapse is extraordinary. The causes of it are not; almost all societies have collapsed because of the vanity of their rulers. The urge to build bigger monuments, have a bigger population and run out of natural resources to support this is a theme that runs through them all. The Anastazi, the Maya, the Sumerians, the Assyrians, the Babylonians, Egyptians, Greeks, Romans, the Easter Islanders: each pushed the limits of nature beyond balance and paid the price. Interestingly, there are only two societies that have stood the test of time and who have remained uninfected for more than three thousand years. They are the Papua New Guinea Highlanders and the people of Tikopia, a tiny island in Melanesia. What have they got in common? They both created social structures and rules which set limits to growth and protected their environment. The Tikopians went so far as to forego having pigs on their island despite pig owning being a sign of wealth and power. They realized that the island couldn’t sustain it and in an act of extraordinary solidarity killed all pigs allowing no exceptions. The Sumerians invented accountancy, which in turn developed writing (initially as lists for accountants). The ordering of things by number and the mathematics of accumulation, which in turn would lead to new power structures that would centralize control, has been practised by each of the civilizations that has turned to dust. We know, with hindsight, that democracy only occurs where more than one group, preferably many, own rights or have access to resources without which the others cannot exercise control. There is no example of a true democracy where there are not many stakeholders. Imposing one where this isn’t the case has always resulted in failure. We have seen that stakeholding can be achieved through the artificial construct of new social groupings (SDI), we have seen where economic strength can be generated by empowering the poor (Grameen) and we have seen the power of public opinion released through “open source” access to knowledge, and, in Hawken, the emergence of a leaderless group of organizations and agencies acting as if they were antibodies to the body politic. Hindsight would confirm all these things to be true. Yet we are in the present reflecting on the future, and history teaches us that writers always get this wrong. Returning to Dan Quinn’s gorilla and his question about natural laws, almost every government and corporation in the world is run on a mechanistic accountancy-based model as if there was a Copernican deus ex machina at play, yet our private lives do not conform to these rigid hierarchies and structures and nowhere in nature is this to be found. Hawken’s observations about the ebb and flow of the NGOs and pressure groups ring true, as does the observation about the emerging virtual society. They have a biological imperative at their heart, not a mechanistic one. The Grameen Bank’s success is based on humane values and rules of engagement. They are intensely personal. All these examples hint at something very significant going on. My father-in-law once said something that has stuck with me: all the problems in the world, save accidents of health or natural disaster, are solvable by common courtesy. Hard Rain is a searing vision of a world in which so much is wrong, and it would be easy to see it through world-weary eyes. Yes, the list of iniquities seems endless, the cruelties and greed of men appear to be unstoppable, yet do stop and ponder the new narrative emerging. Do you not feel the call of destiny, the stirrings of hope that we might just be living in times when we can imagine people like us, all over the world, each drawing confidence from the other? Lighting a bonfire in our hearts to remember to be angry once again and restate our belief in the human values that all religions have tried to harness to themselves – but with such a spectacular failure to deliver that it should now be the turn of the humane secularists? I said earlier that Aldous Huxley was perhaps the only writer who came close to imagining our social future, but I prefer that his vision of a Brave New World is turned into a humane New Brave World, one that reflects our transformation to a narrative based on living with the grain of nature and away from a desire to control all aspects of it – something that hindsight tells us has always resulted in failure. Hard Rain holds a mirror up to the many faces of pain. Relief, if there is any, comes in knowing deep inside what we could be and the shame at how far we still have to go to evolve to a place our imagination tells us we can reach. A smart observer once remarked, “It’s not the disappointment that kills you, it’s the hope.” Dame Barbara Ward, the founder of IIED, said, “We all have a duty to hope”, meaning we have a duty to keep hope alive and act on its possibilities, and she was right. The irony of course is that Bob Dylan’s lyric, like the social futurologists of the 50s, was wrong. I hope that his lyric, newly set to Mark Edwards’ photographs, can be proved wrong all over again. That way hope lies. 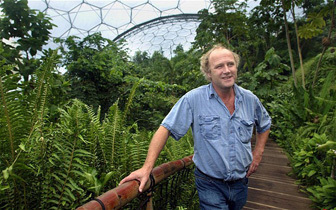 Tim Smit is Chief Executive and co-founder of the Eden Project in Cornwall, a once sterile clay pit transformed into a cradle of life combining world-class horticulture with architecture and installations celebrating the application of science, human endeavour and sustainable living. Tim is also Director of the nearby Lost Gardens of Heligan, which he restored with John Nelson. Born in Holland and educated in Britain, after working as an archaeologist for two years, he switched to the music business and spent ten years as a composer and producer. Tim is a trustee, patron and board member of a number of statutory and voluntary bodies. He has received a variety of national awards including The Royal Society of Arts Albert Medal. In 2002 he was awarded an Honorary CBE in the New Year Honours List and he has received Honorary Doctorates and Fellowships from a number of universities. Tim was voted “Great Briton of 2007” in the Environment category of the Morgan Stanley Great Britons Awards. In January 2011 he was appointed an honorary Knight Commander of the Most Excellent Order of the British Empire (KBE).